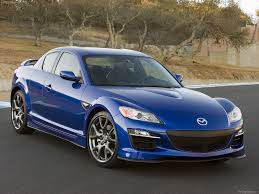 One of the salesmen (who seemed to know what he was talking about) said Mazda has told dealerships they are in the middle of determining whether they should produce either a Mazdaspeed 6, a Mazdaspeed 3, and my personal favorite, a turbocharged RX-8. For those wondering, if the said RX-8 is approved for production, it will have a rotary (I thought Mazda might have given up the ghost, but according to him no), and it would be some sort of 13-B variant (which is what the stillborn 16X was, though it wasn't turbocharged). I think it's fair to say one of those three cars will be produced. Also for those wondering why I was at a Mazda dealership, I have my reasons (which I will talk about later).